Thousands of Palestinians marked land day, on Friday, Palestinian sources said that 100 civilians were injured when Israeli troops attacked protesters in Ramallah and Bethlehem cities. Marking the 36th anniversary of land day today Palestinians and their supporters marched for Jerusalem demanding an end to the Israeli occupation of the city. Protests were organized near the Israeli Lebanese borders as well as the borders with Jordan. The Land day commemoration started in 1976, when Palestinian residents of the Galilee to the Negev protested Israel’s plan to expropriate thousands of dunams of land for security and settlement purposes. Israeli military and police attacked the protests leaving 6 killed, hundreds injured. Today After the midday prayers, people marched from Ramallah city, central West Bank, towards Qalandiya checkpoint that separates Ramallah from Jerusalem. Troops fired tear gas and sound bombs then later used rubber-coated steel bullets. 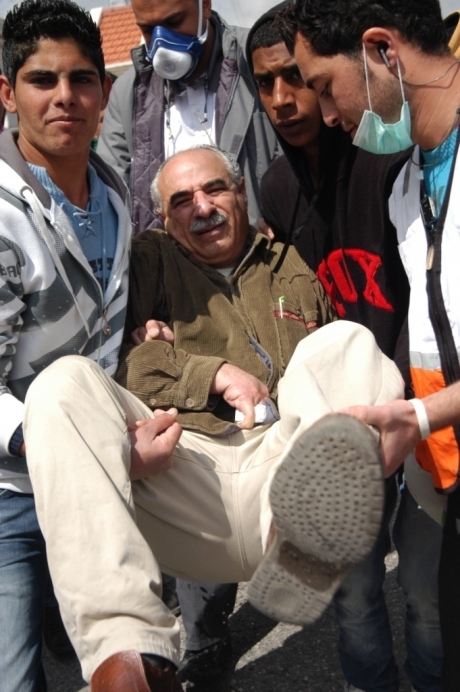 80 Palestinians were injured. Witnesses told IMEMC that among those injured were two Palestinian medics. In Bethlehem 20 residents were injured, seven were moved to hospitals, when soldiers fired tear gas and sound bombs at land day protesters. The marchers were first stopped by the Palestinian security forces however they managed to reach the gate of the wall separating Bethlehem from Jerusalem. As protestors reach the gate, youth threw rocks and firebombs at the wall and the nearby military tower. “We are here to tell the Israeli occupation that Jerusalem is Palestinian and will never forget it.” One of the protesters told IMEMC. Israeli troops responded by firing tear gas and sound bombs. A source from the Palestinian Red Cresent Society told IMEMC that one resident was hit with a tear gas canister in his back causing burns and bruises. The wounded was identified as Yousef Sharqawi from Bethlehem. Another activist from the US was hit with a tear gas canister in his head and was transferred to the hospital for medical treatment. Field medics said his wound is moderate.